The CoffeeShop Blog: CoffeeShop Photo Brad Digital Freebie! CoffeeShop Photo Brad Digital Freebie! I designed little "metal" photo brads for this Facebook cover and wanted to share the brad with you today. It is a simple png file on a transparent background, so simply drag it on your digital designs and Ctrl-T (free transform) it to fit. I love little scrapbooking creations, they can really add quite a bit to digital designs. NOTE: The frame does not come in this download, you can find it here. 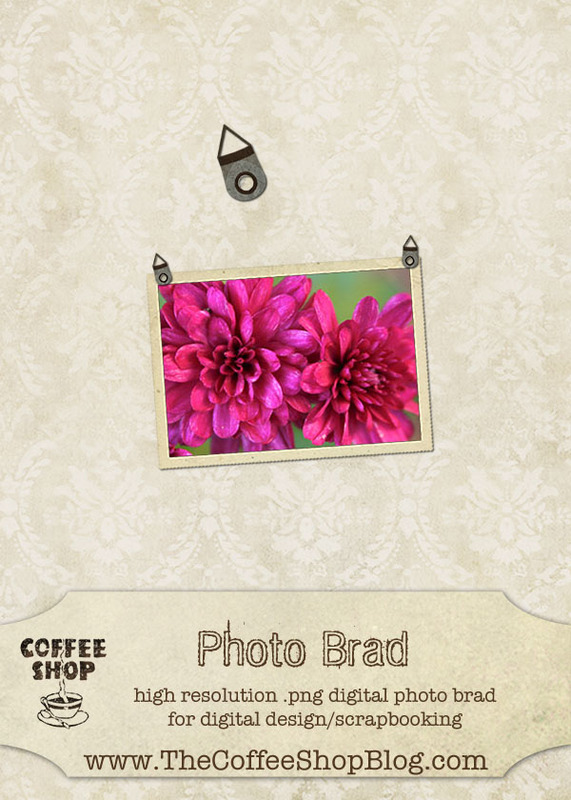 Download the free CoffeeShop Photo Brad. You can also download it here. This is not an action! You are so wonderful for always making these cute things, and especially because they are free. Thanks! this will be so useful. thank you. This is really cute, I will have a good time with it. Thanks. Wishing you much happiness for a wonderful Mothers Day with your two gorgeous boys.